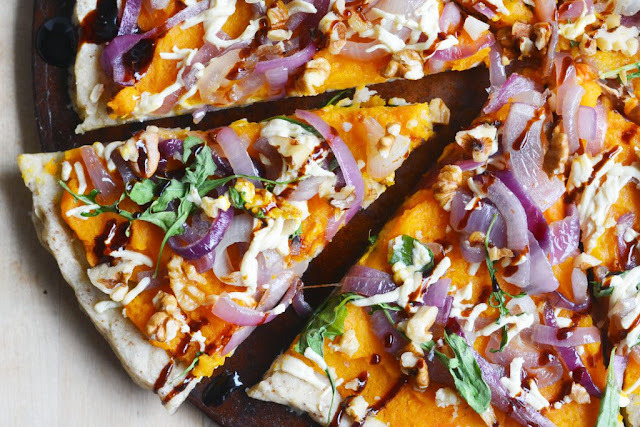 Today’s Vegan & Gluten-Free Butternut Squash Pizza is a seasonal sweet and savory dish that’s simple enough for a weeknight dinner, but delicious (and fun) enough to earn a spot on your next Thanksgiving spread. 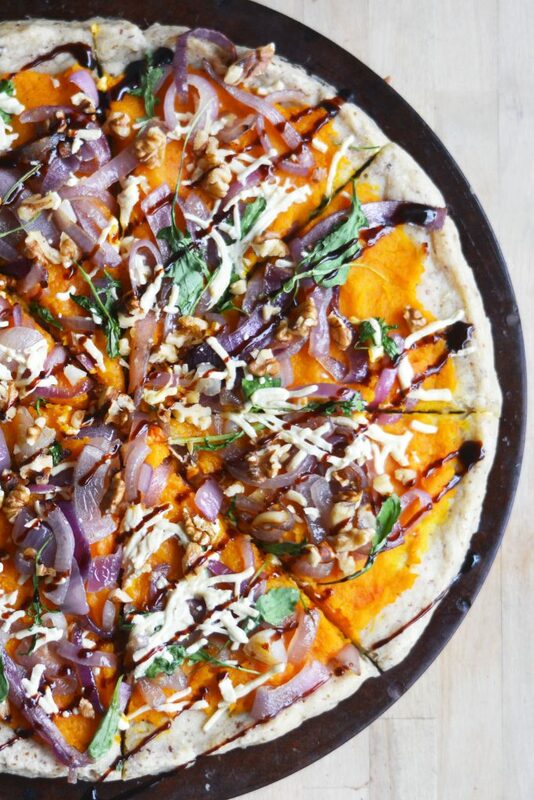 The variety of textures in this pizza, from the creamy pureed squash “sauce” to the crunchy walnuts and melty mozzarella. There’s also such a nice balance between the sweet squash, slightly spicy arugula and tangy/sweet balsamic glaze. If your crust of choice requires it, pre-bake the crust. Prepare the butternut squash layer by stirring the squash puree together with the olive oil, salt and pepper in a small bowl. Set aside. Prepare the onions and garlic by heating 1 tablespoon of olive oil in a medium-sized pan at medium-high heat. Add the onion and garlic, and sautee until lightly browned, about 5-7 minutes. Use a spatula or spoon to spread the squash over the crust. Add the sauteed onion and garlic on top, then sprinkle the cheese over everything. Remove the pizza from the oven and top with walnuts, drizzle the balsamic glaze on top, and sprinkle with salt and pepper. Slice and serve hot! 0 Response to "Vegan & Gluten-Free Butternut Squash Pizza"